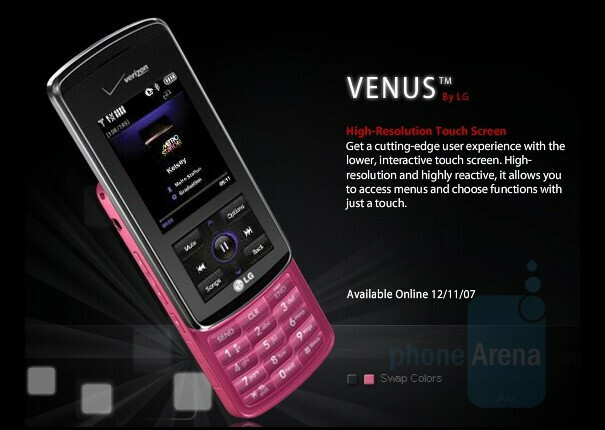 LG Venus in Back: $199 on a 2 year contract and $369 at full retail. 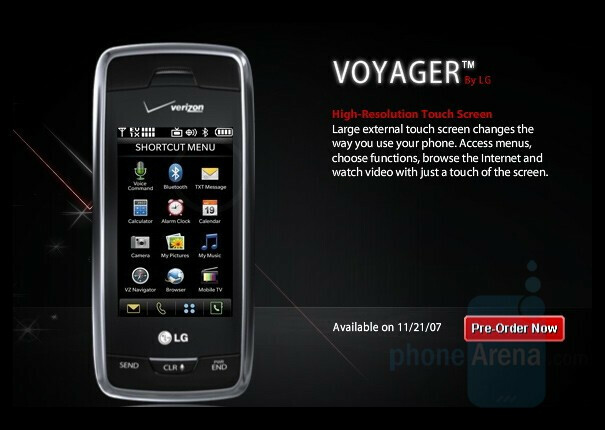 LG Voyager: $299 on a 2 year contract and $469 at full retail. Unfortunately, the Venus in Pink is not listed on the web site. We have been told the pink Venus will we not be released until mid-December. We don't understand why this is, since it makes more sense to have it available before Black Friday (Thanksgiving Weekend). Please continue to check PhoneArena for updates on the Venus and Voyager, as well as our Full Reviews expected later this month. Verizon's Next site now show the Voyager with an Available (shipping and in-store) date of Nov 21. The Venus in Black will be on Nov 19, but the Venus in Pink will not be out until Dec 11. Verizon thanks for not changing on me. Im so proud of you. Maybe I should cook you dinner. What are you doin Nov. 21st....saaaay..... 7:00pm? 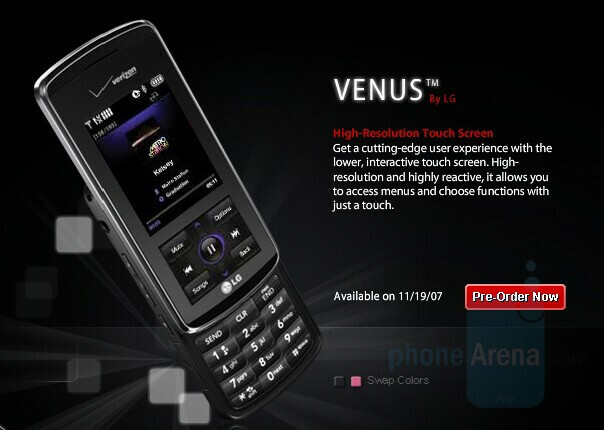 Verizon says neither the Venus nor the Voyager can be pre-ordered. This in spite of publicizing the pre-order day - today - form months now. Anyone know why? Please, don't blame the UI for this. I was able to preorder the Venus, but not the Voyager. The website is having problems processing Voyager preorders right now. I just spoke with a Tier 3 Internet Tech about the Pre-Order issue with the Voyager. She said that they are aware that some customers cannot place pre-orders while others can. They consider this a Priority 1 issue and they have been working on resolving it since 8am. They have received a lot of calls from customers that are having the Pre-order problem. The IT Department said they expect the issue to be fixed within the next 24 hours. What about LG Earth, Mars, Jupiter. and all of the other planets? Verizon are idiots. 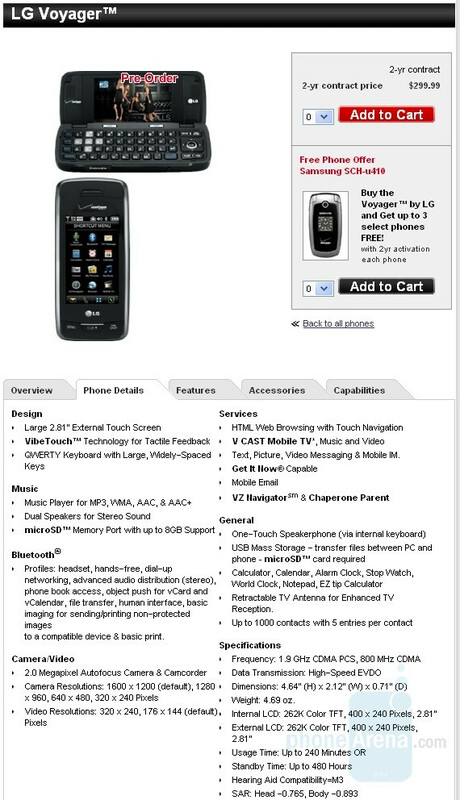 They should have anticipated an overwhelming amount of transactions for this phone. This is a situation that could have been addressed long before it became a problem. Learn from the Iphone, PS3 and other electronic releases. Nov. 11. I tried pre-ordering the Voyager and like everyone else I couldn't so I called customer service and they told me that they all got an email that the voyager can not be pre-order until Nov. 11. Hopefully verizon won't screw the date again. umm yeah there was no email....no one knows why it's not letting you pre order, maybe it's system issue maybe it's like the blackberry when had the html code someone hit release for pre order in error, just like the other guy with cry me a river no one can get it till 11/21 anyway, it's going to be half the price that icrap was and better, gggeeess people didn't you learn from icrap not to jump on it right away anyway how much you want to bet the price drops around the holiday....DUH. Any word on the 6800 release??? These LG phones are nice, but they are more for highschool and middle school. The 6800 is for business professionals. I wish I could keep the same plan and have the Voyager. I lost out on 450 minutes by changing plans. To #14, I hope what you say is true, cus I love my 900 minute plan. Why would you have lost 450 minutes? National pricing and am ch are the same pricing/minute tiers. 900 minutes is the same as it was. no loss! Completely off topic: Anyone know if Verizon is gonna get the LG Viewty?? Or what carrier?? These phones are OK lookin', nothing more. I still pay the same price but I chose the 2nd plan through my new every two. I could have misread, but Im sure I now have 450 minute plan. 900 minute plan was $79.99. I hope VZ can fix it if its a mistake. You know, I really wisht that all these other carriers can just shut the hell up! The fact that their carriers didn't get the Venus and Voyager gives them a license to act like assclowns? The reality is, if AT&T or T-Mobile came out with these phones, it would be the greatest thing in the world. How come no one wants to give credit to Verizon for effort, even if it's not the greatest thing in the world. Again, you can't satisfy everyone, however, I think VZW is making great strides. We may not have the best looking technology in the world, but it sure does work. I think the only time it didn't for me was when I was in Southern Utah. But hey, whatever man. Either ways, all I can say about the Venus and the Voyager is that the phones look impressive and I can't wait for a review on phonearena.com. The Voyager is mine on November 21! What a Thanksgiving gift! I FINALLY got everything to work for my online order & the 50off code says "criteria wasn't met". Ugh! Just got off the phone with verizon... after trying to pre-order the phone for days I was told that there was issue with the website. I checked again last night and it seems like everything was fixed and available to order. I recieved another error message while attempting to change my plan and called verizon. They explained that phone is not available for pre-order in certain areas yet they may be available in other areas. They are still advertising as available for pre-order. Very annoying! I will have to see if I can get it on the 21st in the store. My current phone is hanging on by a thread. UGHHHH!!!! My fiance and I share a family plan, and because of that I can not pre order the Voyager. That is some shady business by Verizon right there...UGH! I am also on a family share plan. I feel your pain. If your on a family share....call and update your plan to Nation family share then you can pre order. We are trying to get everyone on the same system now and that is the new plan, if you don't want charges with data just block it thats free. Any call center you call can bring up your account now, if your in west east can help if your on vacation in florida and from AZ they can bring up your account and upgrade ya. It may be a huge issue for some but in the long run will make your cell phone life easyer. Verizon allows you to pre order, but we are just trying to have people go on the new plan to make it better. OK OK OK .... here it is, straight from the horses mouth! The issue with the pre-ordering was that customers on "older price plans" should never even have been able to see the "Pre-order" option, however they could. ALSO this is a big one here... when you see an add that says "Pre-order here" whatyou also want to look at is the terms that you would need to follow to do so. As previously mentioned to pre order the phones it states right on the site that you have to change to a new "Nationwide" calling plan. Now as far as the plans go, there are 3 tiers of plans available. Basic, Premium, and select. If you are on any old Americas choice or Americas choice family share plan you can select the identicle plan through the Nationwide "BASIC" plan and the only change you will see is to the name of the plan. Nobody is losing minutes or being charged more for anyhing.... I must stress this again... READ READ READ... you wouldnt believe how many problems you could fix on your own if you just read the information in front of you... ALL OF IT ... lol The Select plan takes the same "Basic" Plans and encorporates unlimited texting for all lines on that plan. Its about $20.00 more for standalone plans and $30.00 more for family share plans, secondary lines still $9.99. Lastly there is the "Premium" plan which incorporates Unlimited Messaging, VPAK, NAV & EMAIL, plans starting at 79.99.... so thats the scoop!!! I will do my best to answer all of your questions. 1. You do not need to change your plan to pre order the phone. It doesnt say it on the website, and it makes no sense to assume that it needs to be on a National Plan. The new plan are only to transition into a new billing platform and it outlines some new terms toward data use. So for those afraid to change your plan, Dont be. its still the same tier of minutes on the same service that has always been there. 2. The website can frequent issues. Yes the website isnt perfect. And for those that seem they think they know why the preorder functionality isnt working, stop with the creative guessing. 3. Many have made the point. Each billing region(thier are 4 in the US) has a certain alotment of voyagers available for distribution. You do want to pre order this device. I forsee it going very fast. For those that dont know, Cellular carriers always save thier best devices for the holiday season. Christmas sales is like a last effort to beef up the sales revenue for the year. this is going to be one of the coolest devices Verizon will have for a minute. 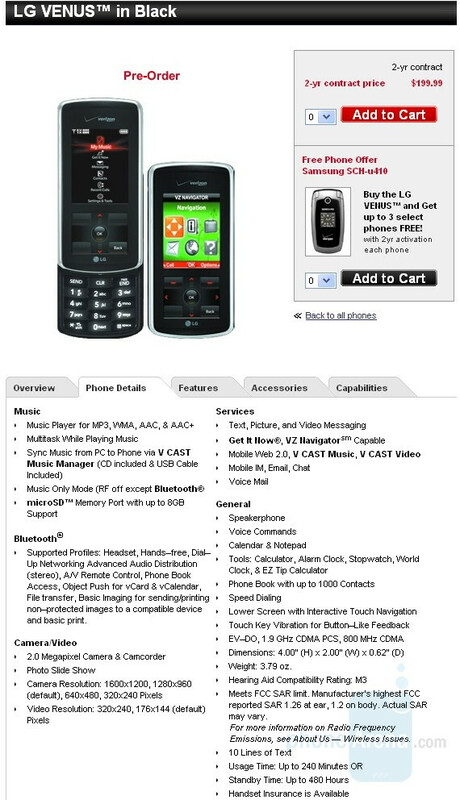 If you can afford it(only$199.99 if you are eligible for ne2) Please believe, this phone is hottttt! My problem is that while this phone looks great, I would have to shell out 80 dollars a month to get the features I would get with the iPhone for $60 a month. I know the VZW plan would have unlimited text, but I only use about 100. I just want e-mail and web. I know the iphone would cost more initially, but factor in the price of a micro sd card and there isn't much difference left. Does anyone know something about plan pricing I don't? ok, first of all. for every1 having problems pre-ordering online, you have to switch from america's choice/family to nationwide. its the same plan but more features (optional). everything's the same price. once you switch over (call customer service and dial 0 to get a direct rep) let them know you want to switch from amer choice to nationwide, make sure you want the same mins and monthly payment as america choice. BUT, in order to have that plan take in affect (so you can order the voyager) you must wait til your billing cycle ends for the america's choice plan. NOW, this is a way for it to go in affect immediately (i forgot the weird name they used) but you can get it affected right there in then. the only thing is, for example; if you have... lets say 6 more days til your next billing cycle is due and you're on a 900min a month plan and you're at 840mins, you're new plan has already switched to the nationwide plan because you asked it to be taken effect right there and then. so, you're left with 60mins til the billing cycle. that's the only risk from switching the nationwide plan right away. like me, in order for me to pre-order online was to switch, which i did, BUT... it wasnt going to take in affect til the 23rd of nov. and i called to switch on the 9th. the rep warned me that i only have 964 mins from now til the 23rd (im on a fam plan 2100 sharing 4 phones) so i took the risk and said "go ahead and lets switch it now cuz i want to pre-order the voyager real bad." then the rep said i was qualified for extra 500 mins. (i guess because i was a long time customer, i dont know, you can ask if you're eligible) so after the phone conversation, we hung up and sure enough i got back on the verizon website and it finally allowed me to place the "pre-order"
This says how to preorder the Voyager: http://estore.vzwshop.com/voyager Must have a Nationwide plan.